Re: How do you get fine detail on planets. It is useful to remember that filters cut down the amount of light. They never brighten anything. However by dimming certain features it can increase the contrast. I have tried for years to see or image features on Venus, but without success. However I still think that observing Venus is interesting but it needs to get near to half phase before it starts to look good. By then it is much bigger. Like this image taken last year. 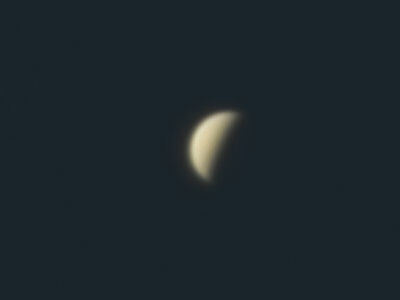 Unfortunately Venus won't reach half phase this year until Aug 15th. By then it will be heading towards the southern part of the ecliptic, and very low down in the sky. Sadly, it will be even worse the next year! However it will be very well placed in 2020. I once used sunglasses to reduce the glare of Jupiter and Venus but now use a moon filter instead. Also worth mentioning that Venus is still a long way from us. It starts getting more interesting from half phase onwards. I have picked up some cloud top features in photographs when it has been a crescent phase.